World 3-2 is the second course of World 3 in Super Mario 3D Land. Mario will start in front of a lake, and he must dive in the water. Underwater, Mario will find a Cheep Cheep swimming around a Warp Pipe, which will lead him back to the surface. Mario will find a P-Switch here, which will form a trail of coins leading to the bottom of the water. Here, he'll find a Fire Flower, some Crates, a Cheep Cheep, and a Timer above the water. Progressing through the lake, Mario will find several Yellow Rings that give him five coins, along with a ? Block, some Brick Blocks, and a Red Ring right above a pit. He'll also find three Cheep Cheeps patrolling an area. After this, Mario will be able to jump out of the water, following the path to a Checkpoint Flag, and then diving again. Here, Mario can press a P-Switch to cause several Yellow Rings to appear. He'll also have to dodge Porcupuffers swimming between small fences. 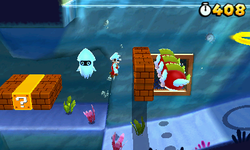 Not only Porcupuffers will try to harm Mario here, but a Spike Eel will also give a challenge to the plumber. Right after the eel, Mario will find a Pipe, leading to the Goal Pole. Star Medal 1: At the end of the first underwater section of the level after entering the first pipe, there will be a cave, which leads behind the area with the Star Medal. Star Medal 2: Near the end of the level, there will be a Spike Eel, with a hole in the ground near it. By going down the hole, there will be a warp pipe, which will take the player to an area filled with coins, blocks, and the Star Medal. Star Medal 3: Towards the end of the level, there is a Spike Eel that will be swimming upward after the pipe. By swimming in that direction, the player will be taken to a hidden area with another pipe and the Star Medal. This page was last edited on April 5, 2019, at 18:08.